Breakfast is served in the former barn, which has been converted into a living-room. Let us tell you about the Jura through out of the ordinary objects, stories from another time and our ancestors’ memory. A small kitchenette with a fridge, a kettle, a microwave oven and some tableware is available. You can consult or borrow tourist maps (50 and 25 thousandth scale), and if you wish to stay in the hamlet surroundings, you will be surprised by the number of walking or cycling trails around the village of Longchaumois. Upstairs, on the bedrooms floor, you will find a lounge with TV, DVDs, various magazines and plenty of leaflets about the most compelling places of interest in our Haut-Jura. 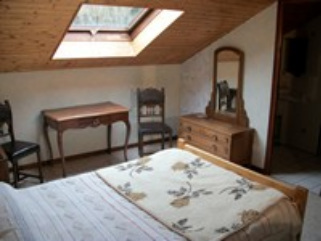 There are private bathrooms and quality beddings in the three rooms, which rank two “ears of corn gîtes de France” (the equivalent of stars for hotels). 2 beds (140cm & 110cm) / bathtub. 3 beds (140, 110 & 90cm) / shower. 1 bed (140cm) / shower.